Want to attract wild birds to your backyard? Visit Geauga Feed for seed. Birds are really beautiful creatures and can provide endless enjoyment for everyone from the curious child to the serious bird watcher. With a few tips and tricks — and the right wild bird food — you can create a backyard habitat that’s a popular flight destination for a variety of feathered friends. Geauga Feed offers a complete line of wild bird feeds and seeds that you can use to attract different species of bird. Stop by our store for help selecting the right feeding products. Or, click the button below to download the Wild Bird Feeding Industry Bird Preference Chart that shows what types of food different wild birds prefer to eat. 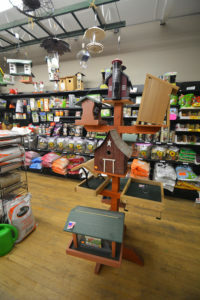 If it’s houses or feeders you need, ours fly off the shelves! Oh, and did we mention our new line of Gord-O birdhouses? These beautifully detailed, albesia wood houses are uniquely hand-carved into round-shaped animals and hand-painted to add color and whimsy to any yard! Visit our store to pick up a Gord-O for yourself or as a gift for someone special. In 1994, Sommers began producing wild bird foods and is now one of the largest manufacturers of these products in Ohio and the surrounding states, shipping over 50 tons of feed every day. We are proud to carry the Sommers line of wild bird food products that are manufactured to the highest quality standards. Martig Farms Birds Luv’Em has delighted Geauga Feed customers and their birds for years. Manufactured locally in Beloit, Ohio, the brand is known for clean, high quality, expert seed blends. With little or no cracked corn, there’s less waste than grocery store brands. Keep in mind that any bird seed is simply a supplement to a wild bird’s diet. They have plenty of other options in nature including worms, insects, and berries. Avoid feeding bread or other human foods to birds that may not be healthy for them. If you’re just getting started, know that it takes time for birds to visit your yard and “get the word out.” Be patient and eventually, you will begin to see some exciting new guests. Water is a great way to attract birds who may want to stop by for a refreshing drink or a splash in a birdbath. In nature, water often has an audible sound that alerts thirsty birds. A small fountain, bubbler, dripper, or mister will help them hear your water source. If you’re aiming to attract a variety of birds, then you’ll need to offer different food types in different types of feeders. Seed mixes and black-oil sunflowers are great choices for beginners. While most people think summer is the best time to feed wild birds, most birds require a little extra human support in late winter or early spring when natural food sources are more depleted. Summer, however, is a great time to provide nectar for hummingbirds and nyjer seed for goldfinches. A yard with trees and bushes will attract more birds than one with simply grass. This is because birds need a safe cover to “scout” their surroundings for threats. This is why you’ll see some birds fly from their safe spot to the feeder and back to their safe spot multiple times. If you are feeding birds in your backyard, then it is important to refrain from using toxic sprays or chemicals. Enjoy your backyard air show! Birdwatching is something everyone can enjoy, and what greater way to experience nature’s feathered wonders than right in your own yard? Have a wild bird question that wasn’t addressed on this web page? Give us a “chirp” at (440) 564-5000 or visit our store the “nest” time you’re in the area.